A conibear safety gripper is a trapping safety tool that everyone should own. This small, simple and inexpensive device could save you from severe injury or even death. Many trappers use body gripping traps commonly referred to as conibear traps to target muskrat, mink and beaver. The design of the body gripping trap is pretty simple. Two metal square jaws are hinged together and they're powered by one or two springs. The "dog" is attached to a trigger which holds the two jaws in the set position. As the animal passes through the trap, the trigger releases and the springs compress the jaws around the animal. The conibear is referred to as a "kill trap." While the smaller 110 sized conibear only uses one spring, the larger 220 or 330 sized traps use 2 springs and are very powerful. In fact, the larger traps are so powerful that even the most experienced trapper will get a little nervous when setting one. You should always be careful when handling and setting a body gripping trap. The size and strength of 220 or 330 trap is nothing to joke about. 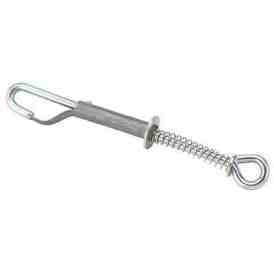 The large springs on a 220 or 330 trap are strong and difficult to compress by hand. A majority of people need to use tongs to compress the springs to set the trap. If you attempt to set the trap and you catch your finger, hand or wrist it's nearly impossible to compress the springs with your one free hand to release yourself. To make things even more dangerous, these larger traps are used in under water sets. A caught hand, under water, in a securely fastened set is bad news. If you use one of these larger style conibear traps you should always use a conibear safety gripper. Don't wait until you have a "near miss" to realize you should use one. How do they work? They're actually pretty simple. The device just clips over the jaws of the trap to stop them from closing if the trap is accidentally sprung. If the trap does accidentally fire, the safety gripper will prevent the jaws from closing on your hands. Since the device is made from metal it will rust a little but with a little care and maintenance it will last for years. Here's one important piece of advice....since you will be near or in the water when using the gripper, tie a rope, lanyard or float to it! Once you drop it in the water (yes at some point you will) the metal device will sink to the bottom and you'll loose it if it's not tied to something. A conibear safety gripper is an inexpensive tool that every trapper should own. Those who have trapped for a while probably know someone who's had a close call with a conibear. Don't wait for an accident to happen. Once you start using one you'll never stop.